With tumbling tots as inspiration it isn't hard to design clothing that is as great to play in as it looks! We work hard to design clothing that is easy to move in and practical for active children. We also know that easy care is important, as is high quality workmanship. Our fabrics are all top quality fabric, mostly 100% cotton, with fine finishing details. All construction materials are sourced from the US whenever possible. The Kiki Collection is based in Richmond, Virginia and our designs are available over the internet and on the east coast through trunk shows. All of our custom made clothing and accessories are made here in Virginia by crafts people who take great pride in their workmanship. We know you will too! Clothing is designed primarily by Julie Ann Wash, with plenty of of input from "Kiki" as well as many other talented women. Take a few minutes to browse and create an outfit that will really showcase your child's personality, whether it is a love of all things magical and princess-related, or fast cars and airplanes! Do you have a tween or big girl? We get it. She needs to be cool, and fun, but still age appropriate. It is a fine line, and we think we have found it! 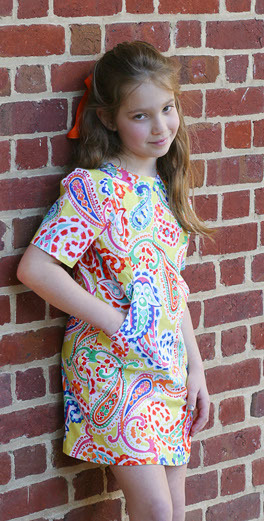 Our tween clothing sizes and big girl styling will make you both happy! Who said buying a thoughtful, beautiful baby gift had to cost a fortune? Pick up a little treat for that new little angel - one that shows you really care! We have selected gifts that are personalized just for baby, but that we know the new mom will treasure just as well! Personalized burpclothes, onsies and fancy pants are a great way to show off a new baby's name, family hobbies, or alma maters!